Look at the tall people, who are here to delight you! They are here to have fun and geek out all over each other. They are here to set the world record for most three-pointers by a duo in one minute (22). They are here to set a total of nine records in a six-minute video. Look, here is Zeus McClurkin, throwing down the most slam dunks ever in a minute (16). Here is Big Easy Lofton, tossing in a blindfolded hook shot from 58 feet back. Here is Thunder Law, nailing the farthest shot in recorded history made while sitting down (58 feet, 9 inches). Watch the video with the audio on, and you will hear the whistling music. It has been remixed, and the remix will delight you. 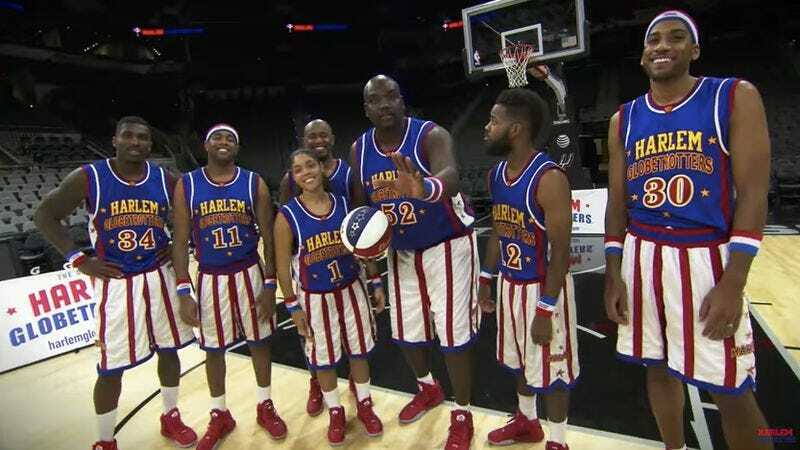 You might recall the Harlem Globetrotters magically appearing at The A.V. Club offices earlier this year to delight both us and indie-folk icon Jeff Tweedy. This is what they do. The Harlem Globetrotters may emerge unbidden from any door in any building at any point to the sound of jovial whistling and much laughter, and they will spin a basketball atop your finger, creating delight.